You might think that mold is very obvious to identify, and it is if you can see it right before your eyes, however, many times mold lurks just outside of your peripheral vision. Mold and mildew can be a hassle for any homeowner no matter where you live. In Logan, if you have mold issues, call Sierra Restoration to help clean it up. Until then, here are some ways to determine if you have it before you get a professional to check it out. Using your senses is the best way to find mold, and the most obvious way to identify mold is if you can see it. Mold is often mistaken for mildew and they do look similar however mildew is most often grey and mold is more often black. You can look up photos of mold and mildew online if you are in any doubt that what you have is mold, or you can call a mold removal company to check it out. If you can see the mold, many times the problem is much more extensive than what you can see. Mold loves to latch onto surfaces and burrow it’s root deep throughout the underlying areas. So if you have mold visibly on the surface of your flooring, it is likely that it has affected the subfloor as well. If you can see mold on your walls, it is likely that it was growing within the walls first. It is highly probable that you have mold before you can even see it. Another way to determine if you have mold is to smell it. 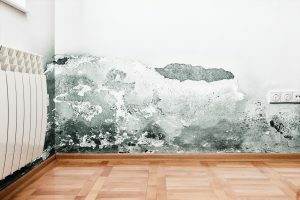 Many times if a home has been vacant for a long time, you will be able to smell the mold right as you walk in the door. This can be a big issue because if you can smell the mold, it means the spores are in the air and those spores can be very dangerous for your health if you breathe them in. The spores can cause respiratory issues, headaches, and in extreme cases, with infants and seniors, it can be fatal. If you are planning on buying a home and you are going on walkthroughs, make sure that you are wary of the smells in each home you go to. Especially in dry areas like Logan, smelling mold in a home can be an indicator of a pipe leak or other water damage issue. Now, if you are walking through a home and you see mold on the wall, you shouldn’t touch it. But if you are walking through a home and the walls seem a bit damaged or the floor doesn’t seem quite perfectly flat, you may want to feel around for soft spots. Soft spots are a sign that water damage and mold have been present in a home and are possibly eating away at the structure. This can be an expensive fix for a mold removal professional to fix, but it is dangerous if you leave it unattended to. If a home smells weird or looks a little off, you might want to have a professional mold removal specialist to come out and at least give you a consultation. Making sure your home is mold free is important for your health and will help your resale value.